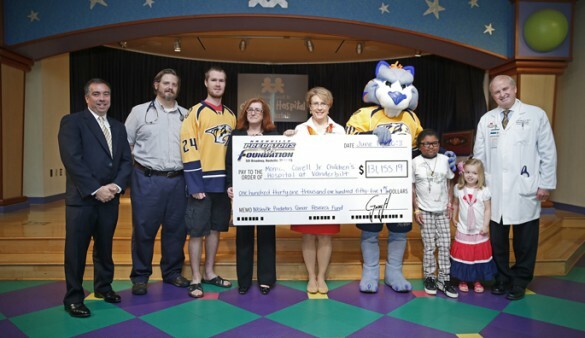 The Nashville Predators Foundation recently presented a $131,000 donation to the Monroe Carell Jr. Children’s Hospital at Vanderbilt as part of the organization’s continued commitment to support cancer research. The gift supports an endowed fund established by the Predators, which helps researchers at Children’s Hospital study the molecular basis of childhood cancer and develop novel treatment approaches to improve outcomes for children. Vanderbilt and the Predators first became strategic partners when they joined forces in 2008, with Vanderbilt signing on as the Predators integrated health care provider. Throughout the five-year partnership, the Predators have donated more than $700,000 and countless hours of community service.